When you’re pregnant or in the early days of parenting, heck probably so long as you’re a parent you’ll get lots of advice. Some good, some, bad, some welcome, some unwelcome. Breastfeeding is one of those things where everyone has an opinion or the perfect bit of advice to help you out. To help you sort through the madness I spoke with some other moms and I’m sharing the 10 top pieces of advice we received about breastfeeding. The best advice I received was to “never quit on a bad day”. There will likely be many bad days in the beginning and new issues will crop up from time to time. Don’t throw in the towel on one of those bad days. You can read my story of breastfeeding struggles and ways to prepare for breastfeeding success if you’re still an expecting mom preparing to breastfeed. Our story ended happily as I never gave up on one of those tough days and we nursed until my daughter self-weaned at 18 months. Now I’m preparing to overcome those tough days all over again with baby #2 on the way. To power through those tough days, you’ll need support. That’s why Kim from Team Cartwright says the best advice she got “was to talk to other breastfeeding moms. Whatever problem you’re having there’s likely another mom out there who has experienced it and survived. Sometimes just knowing you’re not alone can really help you get through the situation. I love this advice shared by Mary Beth from a Reluctant Mom. It’s so true yet advice I haven’t heard before! It’s funny how the simplest advice is sometimes the best advice. Not only did it help with the nursing process, it made me chuckle in a moment that I really needed it! I imagined all those panic-inducing middle school dances with a bunch of angsty tweens trying to figure out how to slow dance. Where to put their hands… which way to sway… super awkward at first, but everyone found their groove in the end. Her advice really calmed me down in that moment of new-mom anxiety. And wouldn’t ya know, as soon as I relaxed and followed my baby’s lead, he latched! I remembered her words whenever we hit roadblocks in our breastfeeding journey… and I credit her that we made it 18 months! Angela from Reading Inspiration said the best advice she received was about getting comfortable. “The best advice I received when breastfeeding was to make sure you find a good comfortable position. If you are comfortable and relaxed it’s likely your baby will feel more relaxed and feed more happily too. When seated make sure your lower back is well supported, use an extra cushion or pillow if needed. Place extra cushions under your arm to support your arm while holding your baby. This will help prevent shoulder strain. It’s especially important to make sure you are well supported in the early stages while you are both settling into breastfeeding and also your body is going through changes and recovery after giving birth. And it’s a good idea to do this if your baby tends to settle down for longer feeds. If you’re looking for a great nursing pillow check out this review of the boppy vs. my brest friend breastfeeding pillow! Enjoy this with your first as your second time breastfeeding may look a bit more erratic! Rebecca from Innate Moves loved receiving advice about trusting in her baby. There are many things people will tell you are signs baby isn’t getting enough but those are mostly just breastfeeding myths! Seeing a lactation consultant and doing a weigh-feed-weigh is the only way to really tell how much milk baby is getting. Self-care is very important as a new breastfeeding mom. Keeping hydrated, fed, and relaxed can make a big difference in your milk production. Jolene from Mum Knows Best shares this great advice about dealing with oversupply. “It happens to all breastfeeding mums. Whilst waiting for milk to come in, we often find that we have to nurse our newborn baby almost constantly. And then, all of a sudden we wake up to breasts that have an oversupply (this usually happens around 3-7 days after the birth of your baby)! Engorged breasts are not fun and it can really be painful. Not only are painful for the breastfeeding mum, but your newborn baby will struggle to keep up with the rapid flow of milk squirting out of your breasts at full speed. The best advice that I have ever received was to treat your sore breasts with both warmth and cold. Whilst warmth will help release the milk, cold can help treat the swollen breasts. Step 1 is to warm up your breast with a nice warm face cloth. This will help to let some of the milk flow out. It is important to let some of the oversupply out of the breast as it will help prevent you from getting mastitis. You should do this several times a day. You can gently massage your breasts to encourage the flow if need be. Step 2 is to treat your sore swollen breasts with cold. I was told to create a breast-shaped ice pack by placing a wet face cloth over a soup bowl into the freezer. Apply the ice pack in a cycle of 10 minutes on, 10 minutes off. This homemade ice pack was truly my lifesaver! If you think you’ve developed a clogged duct check out these other tips for relieving it. Jana Handley from Mommy’s Little World best advice was about not going too deep down the Google rabbit trail because every baby is different! “My best advice was “Do not google stuff!” I panicked when I had my baby girl because every article on google tells you that baby should eat for about 30 min. If baby eats too short, she’s probably not getting enough milk. My baby nursed for 3 to 5 minutes and she was done!!! I was so scared she wasn’t getting enough milk and she’d get sick or something. I went to a lactation consultant at our hospital, tears in my eyes that my baby is not eating. We did weight check (my baby was about 2 months at that time) and turned out she got 3.5 oz in those 3-5 mins. While breastfeeding on demand is important in the early days when you’re establishing supply it can be effective to enforce boundaries when you’re child gets older. They’ll be learning about a lot of different boundaries, breastfeeding and respecting mommy’s body and space will just be a few of them. Melissa from Thrifty Family Travels shared some advice that can be hard to hear. “Whilst I have watched friends and family have wonderful experiences breastfeeding their babies, unfortunately, this was not the case for me. Despite seeing a lactation consultation on multiple occasions, no matter what I did my daughter just screamed and screamed when trying to breastfeed her. It was one of the most unpleasant experiences of my life. I was determined to give my baby the best start in life and persevered as much as I could. To ensure she was, in fact, being fed I began expressing milk and feeding her breast milk by bottle, which she was more than happy to take. However, the routine of constantly expressing milk and then bottle feeding her as well as everything else that goes along with being a new mum was taking its toll on me. 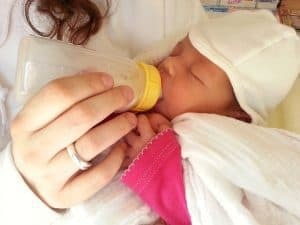 Eventually, at 3 months I stopped breastfeeding and put my daughter onto formula. This is also the moment when I started to enjoy being a mum. My daughter was happy and I was happy and we started to bond together. Breastfeeding can be amazing both nutritionally and relationally, but only so long as it’s not at the detriment to either parties well-being. Thankfully, we live in a time where alternatives are available in case you need to supplement or switch fully to formula at any point. There you have it! 10 amazing pieces of advice about breastfeeding. I hope they help you with your breastfeeding journey. Feel free to share a tip below or with another mom you meet! Supporting each other is what’s it’s all about! Check out my Breastfeeding Page for all my breastfeeding tips, advice, and resources!